"These easy, cheesy jalapeno appetizer squares are wonderful baked delights. 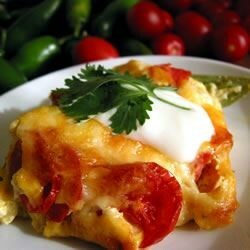 Try them with a dollop of sour cream." In a medium bowl, mix the evaporated milk, water, eggs, Cheddar cheese, flour, baking powder, margarine, green onions and jalapeno peppers. Spread mixture evenly into the baking dish. Bake in the preheated oven 30 to 35 minutes, or until lightly browned. Cool, cut into 1 inch squares and serve. there wasn't a lot of flavour to this recipe - and it flopped at a recent party. The sour cream only added fat grams and calories. If you're wanting some flavour and pizazz keep on looking. A very basic and plain recipe but very good. Use gloves when cutting the jalepenos. These are spicy. I served them with sour cream and salsa to dip them in. Helps to cool it down. This was quick and easy but a bit greasy (it may have been the cheese I used). But my husband LOVED it and there were hardly any left at the party we had so I would say it was a hit! They tasted just fine, but people I served to commented that it tasted like an omelet cut into squares. Unremarkable to them.